Lung cancer. Coloured frontal X-ray of the lungs of a 72-year-old patient with lung cancer. 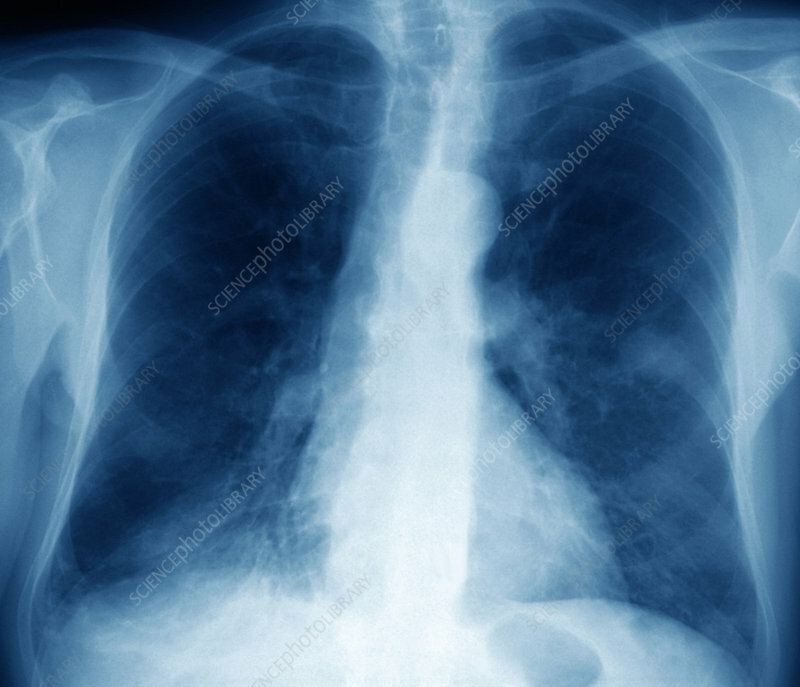 The lungs are the spaces either side of the spine and breast bone (down centre). The heart is at lower centre to lower left. The cancer is in the patient's left lung, and is the round area (white) protruding from the central area at upper centre. This cancer is about 2.5 centimetres in diameter. The main cause of lung cancer is cigarette smoking, but it may also be caused by exposure to certain chemicals, including asbestos. Symptoms include chest pain, shortness of breath and a cough. Treatment is with a combination of chemotherapy and radiotherapy.